My holding Coslight Technology (1043 HK – listed in Hong Kong), a batter producer in China did what is commonly called a turn-around by presenting very strong first half 2016 results. They actually issued an pre-announcement that the results would be significantly better, but the market did not react much on the news. Anyhow the results for H1 2016 was an EPS of about 0.36 HKD per share and at the time the stock traded at about 3.8 HKD. Multiplying the result with 2 gives a forward P/E of about 5, so I think you can understand why the stock soared 30% the next day. Since then the stock has continued to trade very strongly and in a wobbly market closed today at 6.7 HKD up +76% since the result announcements. Since we bought our position in the stock at 2.87 HKD we are now up +133% and our first stock price doubling since the blog started! This also means that the holding is close to my holding guidelines of max 15% position size. I am therefore forced to reduce my position size somewhat, the question is how much and does the stock still have room for more upside? The outstanding results were partly thanks to subsidies by the Chinese government on EVs. And also that the subsidies where design in such a way that it favored EVs who bought batteries produced in China. I bought this stock because it is one of the most pure play Lithium battery producers that is listed anywhere in the world. And even this company is by heritage involved in production of lead acid batteries (which they are currently losing money on) and also doing something as bizarre as mobile games for the Chinese markets. It happens so that the mobile gaming unit is actually very profitable and not at all something to laugh away, it has very high margins and I see it as a free option for launching a new hit game (you never know). The figures in the Semi-annual reports tell a story. The story told is that lead acid battery sales used to be a terrific product, with healthy margins. Coslight made great money on their products and the stock traded in the 10 HKD range in its glory days. Then something must have happened in the industry, because margins deteriorated to the point were Coslight was losing money on its lead acid battery business. At the same the shift started towards Lithium battery production, which has similar healthy margins as the lead acid batteries used to have. 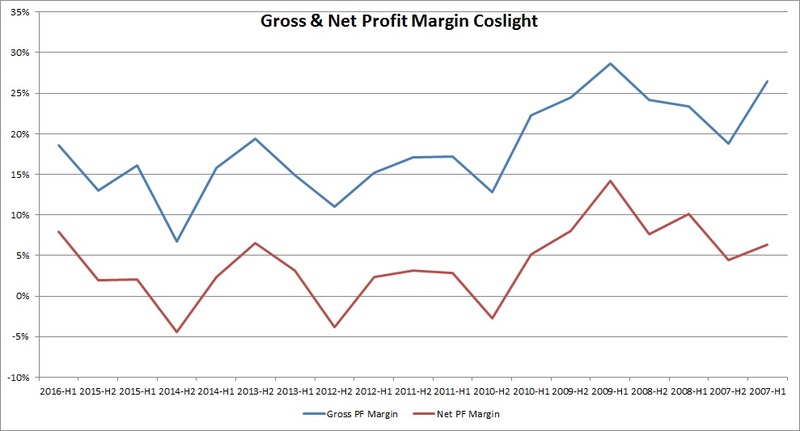 As the graph above shows, net and gross profit margins were healthy back in 2007-2009 and then slumped sharply. Lastly we can see a shift in the trend, where the latest report which created the surge in share price, indicates that the companies sales are back in the healthy area of gross and net profit margin. The reasons for this is because Lithium battery sales has totally taken over and lead acid battery sales has been scaled down significantly. See graph below. Coslight produces batteries for many purposes, it’s not just EVs that are interesting, but also mobiles, laptops, drones and other wearable devices. One big are of sales for Coslight is laptops. I’m impressed with how advanced Coslights battery technology is for the latest generation of laptops. 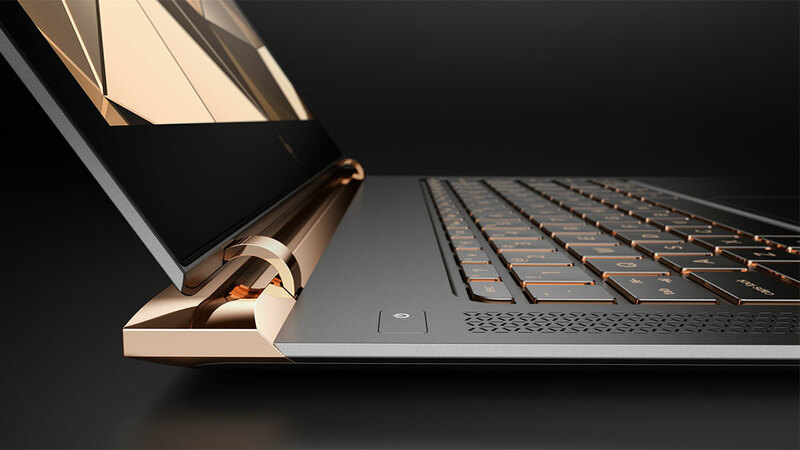 If you haven’t noticed all Laptop brands are coming out with new ultra slim, around 1 cm thick laptops. And I after some serious digging found out that the HP Spectre laptop comes with a Coslight battery. I find this very impressive, the laptop has good battery life although it is so slim. This gives me confidence that Coslight knows what they are doing and are up fighting with the best battery-producers. I will reduce my position because I want to follow my investment guidelines, but only by 25%, I want to keep this as a large position in my portfolio, since this is somewhat of a breakthrough and turn-around in the company. I will hold on to my stocks at least until I see prices around 10 HKD per share, somewhat aggressive to expect the stock surge to continue short-term, but reasonable in the next 1-2 years I think. I already reduced my position once in this stock, now I again sell half my position, since the stocks keeps defying gravity. I’m super happy with the return I got in this stock, but it reached my target price and I see better opportunities elsewhere at these valuation levels. 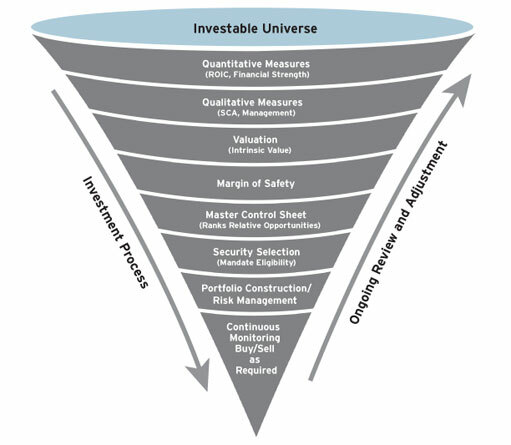 This is my first post where I start defining my own funnel, which in essence is a filter process to get a huge universe down to something manageable. This process is currently rather unclear even to myself. An important part of starting this blog has been to force me to define a funnel, or at least something similar. I need a strategy both for which companies I should look closer at and what to focus on when valuing the company. This may sounds easy, but currently I have a huge lack of consistency on what parameters I evaluate a company on. In a similar way I do not have a process for finding what company is most worthwhile to research. As the name of my blog implies my universe is global and also not restricted at the moment to any minimum liquidity cap. Meaning I more or less have the full world universe at my disposal. Minimal constraints in theory gives most room for out-performance, but looking at it practically a small one man show as mine has no possible chance in a lifetime to evaluate all existing companies, so something clearly needs to be done to narrow this down. I henceforth put a minimum cap on liquidity of average 3 month volume at 100 000 USD. This is very low and I probably will revise this in the future, but I currently have one holding which has poor liquidity and that is Highpower International. Given that I just invest my own money I don’t have a need for high liqudity at the moment. In the future I intend to make my process scalable for investing larger amounts and then I want to already have the same process in place. My thoughts for future minimum liquidity is around 1 million USD average daily volume. This will be my first step in narrowing down the universe. Currently I don’t have brokerage accounts to invest in every single country in the world (few professional investors do either). My investable markets can be summarized as follows: North America, Western Europe, Turkey, Japan, Hong Kong, China, Philippines, Korea, Taiwan, Thailand, Indonesia, Malaysia, Singapore and Australia. Mainly I use what I see, read and experience around me to find interesting prospective investments. I try to think far ahead, what the world will look like in 10 years. 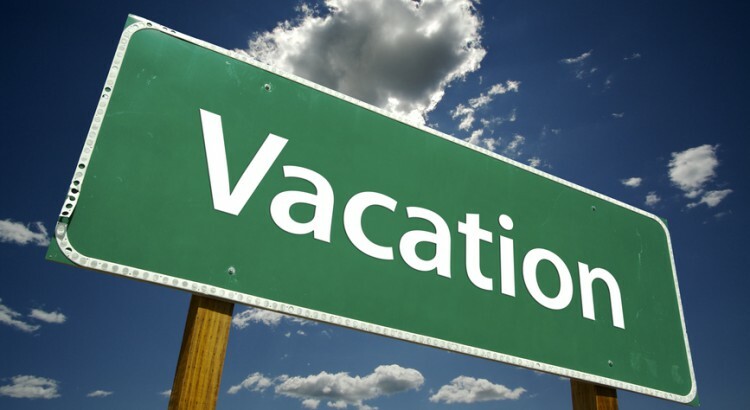 I travel quite a lot, that helps for being able to invest globally and to understand consumer around the world. For example I never visited South America and I’m much less confident to invest in that region just for that sole reason. I also spend a lot of time online reading forums and news. This is close to the core of why I love investing. I’m curious about what people think and I like to learn and understand new things. 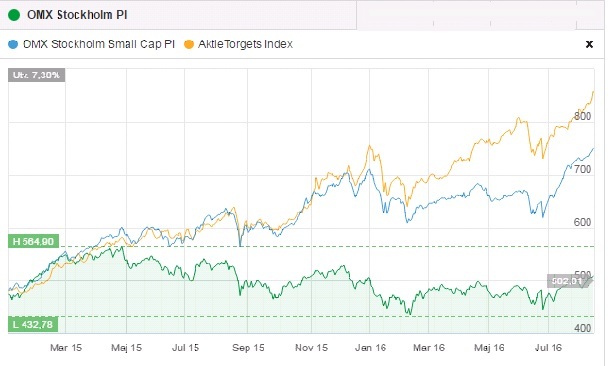 My investment ideas are seldom totally unique, it’s hard to be in a world full of investors, so I steal ideas without shame from all possible sources: fund managers, sell side research, investment blogs, podcast, news articles etc. Here all types of screens could be applied that is relevant for the current Investment Ideas. Something that makes sense in most cases is screening down to Sector/Sub-sector/Industry for a specific country or region. This comes in handy later when doing peer valuations or just comparing which company is most interesting to look further into. As examples one could try to screen for companies involved in battery production all around the world or consumer staples in China. I’m a big believer that its favorable to invest along with some well known factor risk premia. When analyzing famous fund managers that have fantastic track records of generating alpha, their out-performance can often be explained in large part through their investment process. Knowing or unknowingly they have built their investment process tilted towards a risk premia that over time has generated some or all of their funds out-performance. One famous example is Warren Buffet’s value investment-style, in combination with a company structure which has enabled him to take on some leverage to the Beta he has been exposed to. Other famous fund managers have exploited Low Vol strategies or more recently Quality and High Dividend tilts. So the first step for me is to understand/decide what risk premias that are worth investing along with. From the research I read and the experience I gained professionally I have decided to initially focus on Value and Momentum. The reasons for this I will need to explain in further detail later, although some explanations have been given in earlier posts. 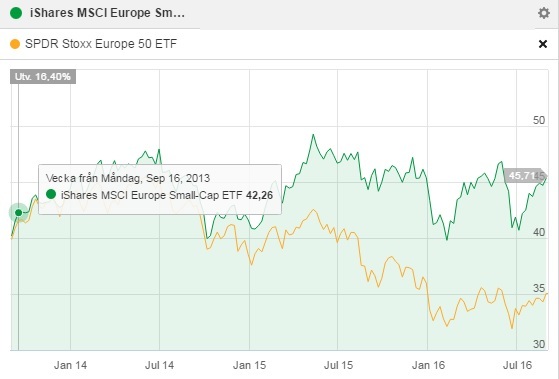 One important aspect of my investment style is finding some sort of future tailwind in my investments. For me these tailwinds can be of very different types, one example would be investing in stocks with Value characteristics. The normal way of thinking about tailwinds would be and industry that has potential for good growth. This type of tailwind that I focused during the last year has been the development of Electric Vehicles (EVs) and the emerging Chinese middle class. Another tailwind I use frequently is just what the market tells me about the price of a stock (price momentum). During the 15 years I invested I always looked at charts and been intrigued by how Technical Analysis (TA) try to capture psychological aspects of investing. 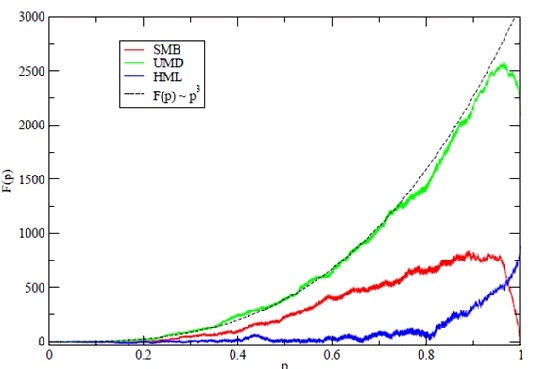 My belief is that there predictive power in price momentum and this has also been shown in numerous research papers. Long term (5-20 years) upwards price trend is also important to me. It tells me that the company has created share holder value over the long-term, surprisingly many large companies have not. Positive price trend over the long term I also call a tailwind. Short term price movements I use to try to time the investment and enter at an attractive level. This is less of a tailwind and more of a proven market anomaly (price momentum) and a personal preference that I like to buy on short term weakness (in general I like to buy stocks on days when the market is down). I realize these attempts at timing might be futile, but I do feel over my 15 years investing I developed some type of fingerspitzengefühl. I might need to back that up with some statistics at some point, that I currently don’t have. When I have more time I will analyze as many past trades as possible and see if I entered the stock at a favorable price point. This is such a big topic and also something I still have much to learn about, so I will cover this in Future posts separately. For the stocks that passed my filters and requirements I want to do a deep analysis of the company and it’s peers. This step will also need a separate post to go through in further detail. Here I also have much to learn, since by profession I’m not an equity analyst, although I have been analyzing companies for many many years in my spare time. The CFA also helped with some techniques and account knowledge. Finally portfolio construction. My aim is to have a portfolio diversified over sectors, countries, style/risk premias and sometimes even currencies. A colleague of mine used to say, diversification is the only free lunch. The meaning of that is that diversification gives you a higher sharp ratio and less company specific risk for free. What you possibly pay is if you have one outstanding idea and you still just invest with a small amount in the idea, to not give up diversification. But this to me is nonsense (as long as you don’t have insider information, which I don’t). In my belief there are no such investment cases which warrants you to go “all-in”. Here I also have some work to do, one reason I have not come so far, is that the amount of stocks I have researched is too narrow. I don’t have a pool of 50-60 good investment ideas to chose from and select those that give me good diversification in the way I mention above. So i don’t expect to develop these last stages of my investment process before I have come further in the earlier steps. So now I have created my first own “Funnel” going from the full investable global universe down to Portfolio construction. All steps are not finalized and I have much more work to do, which will probably take me another year or two to iron out. After that I expect to have a professional investment process to follow. This process will both be built in such a way that it will increase my probability to generate out-performance (by quantitatively filtering out companies with favorable metrics) and suit my investment style and the way I like to invest. Both are equally important to me. I believe that merging quant with stock picking skills is the future and exactly what the most advanced investors are already doing today.